Put the portable convenience of CO2-powered dispensing at your fingertips with this rod and faucet system! Just get the keg, and you'll have the have the party tap ready to go. This gives you everything you need for a classy, unique pour of your beer, coming out of a tower that is included in the setup. 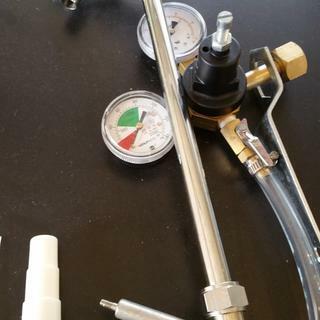 This keg tap kit includes a 5-lb CO2 air tank, high-quality rod and faucet for perfect pours, an air line jumper with clamps to attach a CO2 tank, a double gauge regulator to monitor the tank pressure and the PSI of the beer, a US Sankey (D system) keg coupler, and a tap handle for easy pour control. By using CO2 instead of hand-pumped air, the keg will stay fresh for weeks if kept cold, making this a great option for week-end long parties, camping trips, or other multi-day events. Unlike other, lesser systems, this one has a double gauge regulator that makes it easy to see how much CO2 is left in your tank, so you’re never caught flat-footed and unable to pour. Each of the contact components are made from durable chrome-plated brass, which works well in mobile dispensing systems. Grab a keg and get pouring! Thank you for your feedback. I'm sorry to hear about the issues with the coupler handle. A customer care representative will reach out directly to resolve this issue. Thank you for being a KegWorks customer. Cheers! This is the best system , better then pumping and wasting alot of your beer because of foam ! Great option for events on the go. reliable and portable system for outings when a kegeraor is unavailable. I liked the idea of the CO2 cannister system, but this was over $100 cheaper with the bigger CO2 tank. I used to use a regular barrel and every two hours or so, throw in a couple more bags of ice. Last year, I tried the Super Cooler. it's a bit pricey and I was skeptical, but it worked great! The hole in the top needs to be a little larger, or notched in order for the handle and the tubing to fit properly. We iced the keg on Friday (in shade, 75 F), tapped it on Saturday and there was still ice on Sunday! We have a walk-in refrigerator and the set-up sits on a table in there. Just a classic tub full of ice! Can the rod & faucet system be purchased without the CO2 tank & the price of the system without the CO2 tank? BEST ANSWER: Hi James, this system is available without the CO2 tank. See the attached product link for additional information, including cost. Cheers!